Chronic rejection after lung transplantation is manifested as obliterative bronchiolitis (OB). The development of de novo lymphoid tissue (lymphoid neogenesis) may contribute to local immune responses in small airways. Compared with normal lungs, the lung tissue of 13 lung transplant recipients who developed OB demonstrated a significantly larger number of small, airway-associated, peripheral node addressin-positive (PNAd+) high endothelial venules (HEVs) unique to lymphoid tissue (p < 0.001). HEVs were most abundant in lesions of lymphocytic bronchiolitis and “active” OB infiltrated by lymphocytes compared with those of “inactive” OB. T cells in lymphocytic bronchiolitis and active OB were predominantly of the CD45RO+CCR7− effector memory phenotype. Similar lymphoid tissue was also observed in the rat lung after intrapulmonary transplantation of allograft trachea (Brown Norway (BN) to Lewis), but not after isograft transplantation. Subsequent orthotopic transplantation of the recipient Lewis lung containing a BN trachea into an F1 (Lewis × BN) rat demonstrated stable homing of Lewis-derived T cells in the lung and their Ag-specific effector function against the secondary intrapulmonary BN trachea. In conclusion, we found de novo lymphoid tissue in the lung composed of effector memory T cells and HEVs but lacking delineated T cell and B cell zones. This de novo lymphoid tissue may play a critical role in chronic local immune responses after lung transplantation. De novo lymphoid tissue formation or lymphoid neogenesis has recently been recognized as a potentially important mechanism that supports chronic inflammation in peripheral tissue (1). The best characterized de novo lymphoid tissue is the tertiary lymphoid organ (TLO),3 a structure resembling a lymph node that includes high endothelial venules (HEVs), well-defined T cell and B cell zones, and a germinal center accompanying follicular dendritic cells (2). TLO has been reported in various chronic inflammatory conditions such as autoimmune (3, 4) and chronic infectious diseases (5, 6). Chronic rejection after organ transplantation is a condition in which alloantigen persists and chronic inflammation occurs. Indeed, development of TLO has been reported in various tissues and organs after transplantation, including human cardiac and renal allografts (7) and animal models of cardiac (8), skin (9), and vascular (7) allografts. However, formation of TLO after lung transplantation has not been reported and is controversial. Chronic rejection after lung transplantation is manifested by obliterative bronchiolitis (OB), a chronic inflammatory and fibroproliferative condition in small airways, and its clinical correlate, bronchiolitis obliterans syndrome (BOS) (10). In the lung, TLO is considered to be represented by an inducible form of bronchus-associated lymphoid tissue (BALT), namely iBALT (1, 11). Formation of iBALT has been reported in various chronic inflammatory lung diseases such as emphysema (12), pulmonary fibrosis (13), and chronic hypersensitive pneumonitis (14). In contrast, Hasegawa et al. demonstrated a negative result regarding the relationship between OB/BOS and BALT, which should theoretically include iBALT (15). Although the study using transbronchial biopsies was limited in its sensitivity to detect OB lesions and (i)BALT, it is possible that de novo lymphoid tissue after lung transplantation does not form the conventional structure of TLO with HEVs, T and B cell zones, and germinal center formation. Interestingly, an evolving concept proposed by van Panhuys et al. indicates the existence of “effector lymphoid tissue” (ELT) that exerts effector function by collecting effector and effector memory T cells but does not necessarily take the conventional anatomical form of TLO or iBALT (16). Increasing evidence suggests that the lung might be an important reservoir of effector and effector memory T cells (17, 18). In a s.c. tracheal transplant model of OB, preferential localization of effector memory CD4+ and CD8+ T cells to the lung parenchyma and airways has been demonstrated (19). Thus, we hypothesized that lymphoid neogenesis plays an important role in chronic rejection after lung transplantation. 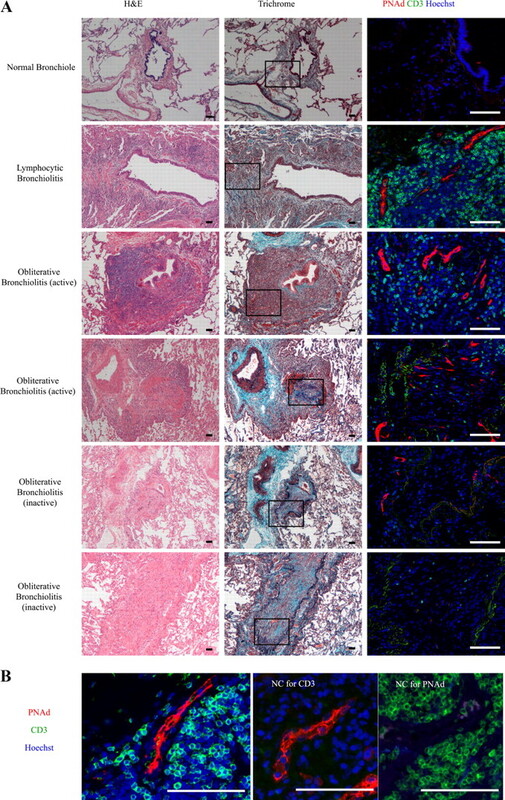 To address the hypothesis, we conducted careful histological and immunohistochemical analyses of the lungs that were explanted at the time of retransplantation due to OB/BOS after the initial lung transplantation. Furthermore, we have devised an animal model that combines a rat intrapulmonary tracheal transplant model of OB (20) and orthotopic lung transplantation to examine the effector function of intrapulmonary de novo lymphoid tissue after transplantation. Human tissue samples of OB/BOS lungs were obtained from patients during their follow-up at Toronto General Hospital (Toronto, Canada). Twelve lung specimens were obtained from patients with established diagnoses of BOS at the time of retransplantation and one lung specimen was obtained at the time of open lung biopsy, which confirmed the diagnosis of OB. Fifteen control lung tissue samples were obtained from patients with early stage lung cancer without any evidence of other previous or current pulmonary disorders (age, 57.85 ± 4.0 (mean ± SEM); seven males and eight female). The human study was approved by the Research Ethics Board of University Health Network, University of Toronto (Toronto, Canada). Male Brown Norway (BN; RT1Au) and Lewis rats (RT1Al) were purchased from Charles River Laboratories. F1 rats were bred from male BN and female Lewis rats at the Toronto General Research Institute (Toronto, Canada). Intrapulmonary tracheal transplantation was conducted as previously described (20). Animals were sacrificed at postoperative days 7, 28, 60, and 120 for the following analyses (n = 5 for each time point and group). Intrapulmonary tracheal transplantation followed by orthotopic lung transplantation (Fig. 5A). Rat intrapulmonary tracheal transplantation was conducted as described above at day 0. After 7 or 28 days, the left lung of the intrapulmonary tracheal transplant recipient was used as a donor lung for orthotopic left lung transplantation using surgical techniques described previously (21). The recipient animals of orthotopic lung transplantation were sacrificed 28 days after lung transplantation (i.e., day 35 or 56 after the initial intrapulmonary tracheal transplantation; n = 4 for each group). Intrapulmonary tracheal transplantation followed by orthotopic lung transplantation in combination with concurrent second intrapulmonary and s.c. tracheal transplantation (Fig. 8A). Rat intrapulmonary allograft tracheal transplantation (BN to Lewis) was conducted as described above. After 28 days, the left lung of the initial intrapulmonary tracheal transplant recipient was used as a donor lung for orthotopic left lung transplantation. After reperfusion of the left lung graft, a secondary tracheal graft from a BN rat was implanted in the left lung adjacent to the first intrapulmonary tracheal graft using the same technique as regular intrapulmonary tracheal transplantation. Another tracheal graft from a BN rat was implanted in the dorsal s.c. tissue through the site of thoracotomy. The recipient animals of orthotopic lung transplantation were sacrificed 28 days after the concurrent transplantation (i.e., 56 days after the initial intrapulmonary tracheal transplantation; n = 4). All animals received care in compliance with the Guide to the Care and Use of Experimental Animals formulated by the Canadian Council on Animal Care. The experimental protocol was approved by the Animal Care Committee of the Toronto General Research Institute. Formalin-fixed, paraffin-embedded tissues cut into 5-μm-thick sections were used for standard H&E stain, elastic trichrome stain, and all human immunofluorescence labeling studies. CD3 (rabbit anti-human), CD20 (mouse anti-human), Ki-67 (mouse anti-human) (DakoCytomation), Ki-67 (rabbit anti-human, Lab Vision), CD45RO (Serotec), peripheral node addressin (PNAd; BD Biosciences), and CCR7 (Novus Biologicals) were used with the appropriate isotype-specific Ig as negative control. For rat specimens, the following primary Abs reported to react with rat tissue were used: rabbit anti-human CD3 (DakoCytomation) and mouse anti-human CD79a (Abcam) for formalin-fixed paraffin-embedded or frozen sections; and mouse anti-rat mucosal addressin cell adhesion molecule (MAdCAM)-1 (BD Biosciences), rabbit anti-human von Willebrand factor (Millipore), and anti-rat RT1Au (OX27; Serotec) for frozen sections. Immunofluorescence labeling was conducted as described previously (22). In the human study, serial sections were cut from two to five blocks obtained from different areas of a single lung specimen and stained for OB/BOS, H&E, elastic trichrome, and CD3/CD20. H&E and trichrome staining was used to identify bronchioles, whereas for individual bronchioles H&E and CD3/CD20 staining was used to evaluate the extent of inflammation and lymphocyte infiltration. Trichrome staining was used to evaluate lumenal obliteration. Bronchioles with lymphocyte infiltration and without lumenal obliteration were classified as lymphocytic bronchiolitis; bronchioles with obliteration were classified as OB, among which those with lymphocyte infiltration in or around the bronchiole were classified as “active OB” and those without such infiltration were classified as “inactive OB.” Each bronchiole was also evaluated for HEVs using PNAd staining. In the animal study, the size of lymphocyte aggregates was morphometrically classified using ImageJ, version 1.30 (W. Rasband, National Institute of Mental Health, Bethesda, MD). The number of CD3+ T cells infiltrating into the tracheal graft was counted in 10 randomly selected high power fields confined to the obliterated area. To standardize the number of HEV+ bronchioles (human study) and the size of lymphocyte aggregates (animal study), the whole lung area was scanned using SNAPSCAN e50 (Agfa) and the size was calculated using ImageJ software. The following anti-rat Abs and appropriate IgG isotype controls were purchased from BD Pharmingen: FITC-labeled CD3 (G4.18), PE-Cy5-labeld CD4 (OX35), Alexa Fluor 647-labeled CD8 (OX8), PE-labeled CD45RC (OX22), and PE-labeled RT1Au (OX27). Cell surface staining was conducted as described previously (22). Data are expressed as means ± SEM. When comparing two groups, data were analyzed with t tests. When comparing three groups, one-way ANOVA was followed by post hoc Tukey tests. All statistical analyses were performed using JMP 5.0 (SAS Institute). Values of p ≤ 0.05 were considered to be significant. We examined 13 human lungs from patients that developed BOS after lung transplantation and compared them with 15 normal lung controls. Patient demographics are shown in Table I⇓. Histologically, all of the posttransplant lungs contained multiple OB lesions and 11 of them also contained airway inflammation without obliteration (lymphocytic bronchiolitis). Among 164 OB lesions examined, 65 (39.6%) were classified as “active” lesions while the others were classified as “inactive” based on H&E, elastic trichrome, and CD3/CD20 staining as described in Materials and Methods. In immunofluorescence labeling for T cells and B cells, we observed a number of T cells and a relatively small number of B cells in lymphocytic bronchiolitis and active OB lesions, whereas inactive OB lesions and normal lungs contained only a small number of T cells and B cells (Fig. 1⇓A). In lymphocytic bronchiolitis and active OB lesions, the memory T cell marker CD45RO was largely colocalized to CD3+ T cells, demonstrating that T cells in active inflammatory lesions in BOS lungs are mostly memory T cells (Fig. 1⇓B). Furthermore, CCR7, a chemokine receptor expressed by naive and central memory T cells but not by effector and effector memory T cells (23), was not localized to CD45RO+ cells, demonstrating that memory T cells in BOS lungs are of an effector memory phenotype (Fig. 1⇓C). Effector memory T cells in airways after lung transplantation. A, H & E staining of a normal airway and lesions of lymphocytic bronchiolitis, active OB, and inactive OB (top panels) and the corresponding immunofluorescence labeling for T cell (CD3) and B cell (CD20) staining (bottom panels). B, Immunofluorescence labeling for CD3 and CD45RO, a marker of memory T cells. Pictures were taken from the same active OB lesions as in A. C, Immunofluorescence labeling for CD45RO and CCR7, a marker for naive and central memory T cells. Scale bar, 50 μm. NC, Negative control. The aggregates of effector memory T cells in BOS lungs do not completely meet the anatomical criteria of secondary or tertiary lymphoid tissue because they do not include segregated T cell and B cell zones (Fig. 1⇑A) or B cell follicles positive for CD21+ follicular dendritic cells (data not shown). Conversely, immunofluorescence labeling for Ki-67 (a cell proliferation marker) demonstrated a relatively small number of proliferating B cells as well as T cells in the lymphoid tissue (data not shown). Although histologically obvious germinal centers were not identified in the study, T cell-dependent B cell maturation is still theoretically a possible component of the intrapulmonary lymphoid tissue. HEVs are specialized endothelial lined vessels that exist uniquely in lymphoid tissue and play critical roles in lymphocyte trafficking (24). 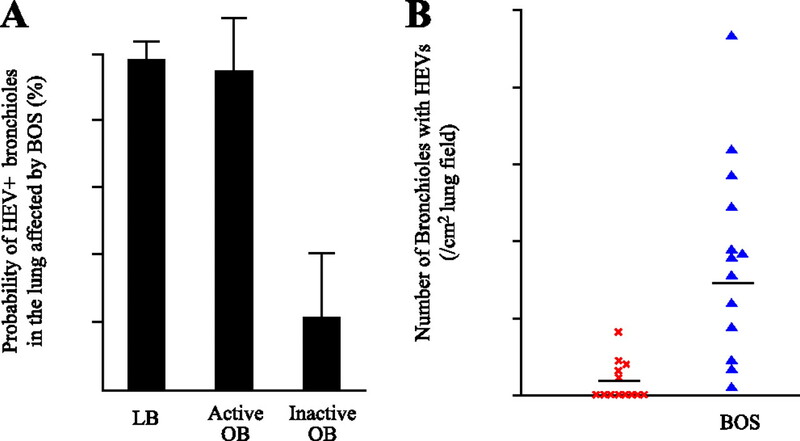 Interestingly, immunofluorescence labeling for PNAd, a marker specific for HEVs, demonstrated a large number of HEVs composed of characteristic cuboidal endothelial cells in the airways of BOS lungs, whereas bronchioles in normal lungs did not show HEVs (Fig. 2⇓). Because HEVs positive for PNAd are considered to be unique to secondary and tertiary lymphoid organs, a similar finding in a nonlymphoid organ was surprising to us. Through quantitative evaluation we found that HEVs existed in almost all of the lesions of lymphocytic bronchiolitis and active OB lesions in the bronchiolar wall (Fig. 2⇓A), whereas a portion of inactive OB lesions were also accompanied by a small number of HEVs (Fig. 3⇓A). In some active OB lesions, HEVs were also observed in the lumen of obliterated airways, suggesting that the induction of HEVs can occur through angioneogenesis. Development of HEVs in small airways after lung transplantation. A, H & E staining, trichrome staining, and double immunofluorescence labeling for CD3 and PNAd, a marker of high endothelial venules. Representative pictures of a normal bronchiole (top) and lesions of lymphocytic bronchiolitis (second from top), active OB with lymphocyte infiltration in the lumen (third from top) active OB with lumenal fibrosis and peribronchiolar lymphocyte aggregates (fourth from top), and two inactive OB lesions (fifth and sixth from top, only one of which shows positive PNAd staining). B, Higher magnification of a PNAd+ HEV in an active OB lesion. Scale bar, 100 μm. NC, Normal control. HEVs are associated with lymphocytic bronchiolitis and active OB. A, Quantification of the number of bronchioles positive for PNAd demonstrates that most of the lesions of lymphocytic bronchiolitis (LB) and active OB accompany HEVs. B, Quantification of the number of bronchioles positive for PNAd demonstrates a significantly larger number of bronchioles accompanying HEVs in the lung affected by BOS compared with that of normal lung control (p < 0.01; n = 15 and 13 in control and BOS, respectively; the mean values are indicated by filled bars). The percentages of lymphocytic bronchiolitis lesions, active OB lesions, and inactive OB lesions that are accompanied by HEVs is shown in Fig. 3⇑A. The number of bronchioles with accompanying HEVs per unit lung area was significantly larger in BOS lungs than in normal lungs (Fig. 3⇑B; p < 0.01). The small number of HEVs observed in normal lungs is considered to represent constitutive BALT. A rat intrapulmonary tracheal transplant model of OB is an animal model of OB that reflects the influences of the pulmonary milieu (20, 22). This model enables examination of the pulmonary immune system’s reaction to allogenic stimuli. In the present study, we examined whether lymphoid tissue also develops in the lung in fully MHC-mismatched intrapulmonary tracheal transplantation (BN donors to Lewis recipients) and compared them with syngenic intrapulmonary tracheal transplantation (Lewis to Lewis). In normal lungs of Lewis rats (i.e., without transplantation), we observed a small number of lymphocyte aggregates that are consistent with the reported constitutive BALT in rats (25). After intrapulmonary tracheal transplantation, the recipient lungs of both isografts and allografts showed lymphocyte aggregates around bronchioles at day 7 (Fig. 4⇓A). By day 28, the lymphocyte aggregates were diminished in isograft recipients, whereas allograft recipient lungs exhibited dense lymphocyte aggregates composed of T cells as well as B cells (Fig. 4⇓B). At day 28, isografts showed complete recovery of the epithelial cells with no evidence of obliterative fibrosis, while allografts showed total loss of the epithelium with obliterative airway fibrosis (Fig. 4⇓B, insets). The lymphocyte aggregates in allograft recipient lungs persisted until the end of observation at day 120 (Fig. 4⇓C). Morphometric quantification demonstrated a significantly larger number of lymphocyte aggregates in allograft recipients at day 28 and after (Fig. 4⇓D). These results demonstrate that the persistence of lymphocyte aggregates in the lung is an alloantigen-dependent process. Development of effector lymphoid tissue in airways after intrapulmonary tracheal transplantation. A and B, H & E staining (top panels) and double immunofluorescence labeling for CD3 (T cell) and CD79a (B cell) (bottom panels). Representative pictures of recipient lungs of intrapulmonary isograft and allograft tracheal transplantation at days 7 and 28 are shown. Insets in B are corresponding tracheal grafts (original magnification, ×40). C, H & E staining of recipient lungs of intrapulmonary isograft and allograft tracheal transplantation at day 120. Arrows indicate peribronchiolar lymphocyte aggregates. D, Morphometric quantification of lymphocyte aggregates in the recipient lungs that received an isograft and an allograft. Allograft recipient lungs demonstrated a significantly larger number of lymphocyte aggregates than those of isograft recipient lungs at day 28 and after (p < 0.05). n = 4–5; mean ± SEM. E, Flow cytometric analysis of CD4 and CD45RC expression on CD3+ T cells in the spleen, mediastinal lymph nodes, and the left lung at day 28 after intrapulmonary allograft tracheal transplantation. Cells were first gated by CD3 positivity. F, Double immunofluorescence labeling for von Willebrand factor (vWF) and MadCAM-1 (top panel) and CD3 and CD79a (bottom panel) taken from a similar area of a well-developed lymphocyte aggregates at day 56 after intrapulmonary allograft tracheal transplantation. The arrow indicates a HEV-like vessel observed in the aggregate of T cells. Scale bar, 100 μm. NC, Negative control. In rats, loss of the CD45RC expression is considered to represent maturation into memory T cells, equivalent to CD45RO expression in humans (23). Flow cytometric analysis of allograft recipient lungs at day 28 demonstrated that > 90% of T cells in the lung tissue are of the CD45RC− memory phenotype after allograft tracheal transplantation at day 28, whereas mediastinal lymph nodes and spleen tissue showed smaller numbers of memory T cells (Fig. 4⇑E). Although demonstration of HEVs in rat lungs was limited by the unavailability of an anti-rat PNAd Ab, we used MadCAM-1, another marker of HEVs, in combination with von Willebrand factor, a marker of vascular endothelial cells. Indeed, we observed MadCAM-1+von Willebrand factor+ HEVs in well-developed lymphocyte aggregates (Fig. 4⇑F). These observations indicate that lymphocyte aggregates that develop after intrapulmonary allograft tracheal transplantation are likely to be de novo lymphoid tissue, similar to those observed in transplanted human lungs. We subsequently addressed the question regarding whether or not the lymphocyte aggregates become a stable structure in association with the stable homing of memory T cells. Following initial intrapulmonary allograft tracheal transplantation (BN to Lewis), we conducted orthotopic transplantation of the Lewis lung containing a BN tracheal graft into an F1 (BN × Lewis) rat at day 7 or day 28 (Fig. 5⇓A). Because F1 rats should accept both Lewis-derived and BN-derived grafts, the only components that could reject BN-derived grafts are Lewis-derived lymphocytes that may persist in the lung after orthotopic lung transplantation into an F1 rat. Lymphocyte aggregates are immature at day 7 after intrapulmonary allograft tracheal transplantation. A, Study design of combined intrapulmonary tracheal transplantation (red) and orthotopic lung transplantation (blue), which was conducted at day 7 or day 28. ∗, Lymphoid tissue formation is minimal after isograft tracheal transplantation as shown in Fig. 4. B, A result of intrapulmonary tracheal transplantation followed by orthotopic lung transplantation at day 7. Representative pictures (H & E staining) of a recipient lung (top panels) and the corresponding intrapulmonary tracheal graft (bottom panels) at day 35 are shown. Scale bar, 500 μm. C, Morphometric quantification at day 35 demonstrates a significantly larger number of peribronchiolar lymphocyte aggregates in the recipient lung of BN-Lewis-Lewis transplantation as compared with the other two groups (p < 0.05); n = 4, mean ± SEM. Lew, Lewis. In the first set of experiments wherein orthotopic lung transplantation was conducted at day 7, peribronchiolar lymphocyte aggregates in the Lewis lung disappeared and the BN graft showed recovery of the epithelium with little subepithelial fibrosis at day 35 (Fig. 5⇑B). The “negative” control of Lewis-Lewis-F1 transplantation also demonstrated minimum lymphocyte aggregates and complete recovery of the tracheal graft in contrast to the “positive” control of BN-Lewis-Lewis transplantation in which graft rejection should continue, and indeed lymphocyte aggregates were still observed in the lung with obliterated BN trachea (Fig. 5⇑B). Morphometric quantification demonstrated significantly larger lymphocyte aggregates in BN-Lewis-Lewis transplantation at day 35 compared with the other two groups (Fig. 5⇑C). Thus, the intrapulmonary lymphocyte aggregates at day 7 are still immature and incapable of stably harboring memory T cells. Conversely, the second set of experiments wherein orthotopic lung transplantation was conducted at day 28 demonstrated stable homing of memory T cells. In BN-Lewis-F1 transplantation, the lymphocyte aggregates in the peribronchiolar tissue were obviously enlarged compared with those in the other two groups and extended into the perigraft tissue at day 56 (i.e., 28 days after orthotopic lung transplantation) (Fig. 6⇓A). The “negative” control of Lewis-Lewis-F1 transplantation showed the small size of lymphocyte aggregates, whereas those of the “positive” control of BN-Lewis-Lewis transplantation were similar to those of the untreated allograft transplantation control. Morphometric quantification confirmed the significantly larger size of lymphocyte aggregates in the group of BN-Lewis-F1 transplantation (p < 0.05; Fig. 6⇓B). Lymphocyte aggregates become mature by day 28 after intrapulmonary allograft tracheal transplantation. A, Result of intrapulmonary tracheal transplantation followed by orthotopic lung transplantation at day 28. Representative pictures (H & E staining) of a recipient lung (top panels) and the corresponding intrapulmonary tracheal graft (bottom panels) at day 56 are shown. Scale bar, 500 μm. B, Morphometric quantification at day 56 demonstrates a significantly larger number of peribronchiolar lymphocyte aggregates in the recipient lung of BN-Lewis-F1 transplantation as compared with the other two groups (p < 0.05). n = 4; mean ± SEM. Lew, Lewis. Flow cytometric analyses demonstrated that a significant percentage of Lewis-derived RT1Au(−) CD4+ T cells and CD8+ T cells exist in the left lung in BN-Lewis-F1 transplantation as compared with the other groups (Fig. 7⇓A). 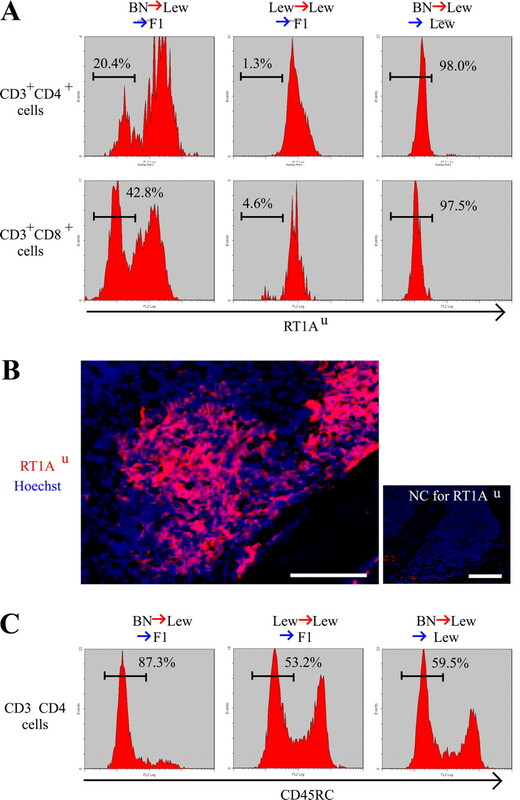 Immunofluorescence labeling for RT1Au in the lymphocyte aggregates in the lung after BN-Lew-F1 transplantation demonstrated chimerism of F1-derived RT1Au(+) cells and Lewis-derived RT1Au(−) cells (Fig. 7⇓B). Moreover, the majority of CD4+ T cells in the lung of the BN-Lewis-F1 transplantation group demonstrated a higher ratio of the CD45RClow memory phenotype as compared with the other groups (Fig. 7⇓C). This ratio was also higher than those of the opposite lung, mediastinal lymph nodes, and spleen (<60%), indicating that memory T cells dominantly exist in the orthotopically transplanted lungs in association with lymphocyte aggregates. Stable homing of T cells derived from the initial tracheal transplant recipient and memory T cells in the lung. A, Representative results of flow cytometric analysis for the expression of RT1Au (expressed by BN and F1) by CD3+CD4+ cells (top panels) and CD3+CD8+ cells (bottom panels) in the lung. B, Immunofluorescence labeling for RT1Au demonstrating chimerism of peribronchiolar lymphocyte aggregates at day 56. Scale bar, 100 μm. C, A representative result of flow cytometric analysis for the expression of CD3+CD4+CD45RClow memory T cells in the lung. These results were obtained at day 56 from the left lung after intrapulmonary tracheal transplantation (day 0) followed by orthotopic left lung transplantation (day 28). Lew, Lewis; NC, negative control. This overexpansion of lymphocyte aggregates, which was even greater than that of the BN-Lewis-Lewis “positive” control transplantation, was somewhat surprising to us. We speculate that Lewis-derived RT1Au(−) lymphocytes homing to the lung reacted to F1-derived RT1Au(+) lymphocytes. The Lewis lung containing the BN trachea was orthotopically transplanted into an F1 host because an F1 rat should not reject either Lewis or BN-derived tissue; however, the opposite is not true and, if there were significant Lewis-derived lymphocytes they could theoretically be reactive to the F1 host-derived cells through a mechanism similar to graft-vs-host disease, which can lead to OB after hematopoietic stem cell transplantation (26). The previous experiment could not demonstrate the effector function of intrapulmonary lymphocytes against the airway graft because the allograft trachea was already obliterated when orthotopic lung transplantation was conducted at day 28. Thus, we added a second intrapulmonary tracheal transplantation at the time of orthotopic lung transplantation at day 28 (Fig. 8⇓A). At day 56 after the initial intrapulmonary tracheal transplantation (i.e., 28 days after orthotopic lung transplantation), the first intrapulmonary BN-derived tracheal grafts showed total loss of the epithelium and lumenal obliteration with fibrous tissue (Fig. 8⇓Ba, top graft). The histological characteristics of the fibrous tissue of the first BN grafts were similar to those of untreated control allografts (Fig. 3⇑A). In contrast, the second intrapulmonary BN-derived tracheal grafts showed a massive infiltration of inflammatory cells with total loss of the epithelium (Fig. 8⇓Bb). Immunofluorescence labeling for CD3 demonstrated that the majority of the infiltrating cells are T cells (Fig. 8⇓Bb, inset). Conversely, the second intrapulmonary Lewis-derived trachea (i.e., isograft) implanted adjacent to the first BN-derived trachea showed minimum inflammatory infiltration (Fig. 8⇓Bc), loose fibrosis, and partial preservation of the epithelium (Fig. 8⇓Bd, arrow) with minimal T cell infiltration (Fig. 8⇓Bd, inset), whereas the first BN-derived trachea was obliterated with fibrous tissue similarly to that of the other group (data not shown). Semiquantification of CD3+ T cells demonstrated a significantly larger number of T cells infiltrating into the secondary BN-derived “allo” graft compared with that of the Lewis-derived “iso” graft (Fig. 8⇓C). The effector function of lymphocytes in the lung. A, Study design of intrapulmonary tracheal transplantation followed by concurrent orthotopic lung transplantation, secondary intrapulmonary tracheal transplantation, and s.c. tracheal transplantation. Ba, Representative picture of the first and second intrapulmonary BN-derived tracheal grafts in the Lewis-derived lung implanted in an F1 host. Bb, Higher magnification of the boxed area in a. Inset indicates CD3 staining demonstrating massive infiltration of T cells in the secondary BN graft. Bc, Representative picture of secondary intrapulmonary Lewis-derived tracheal graft implanted adjacent to the first BN-derived graft. Bd, Higher magnification of the boxed area in c. Arrow indicates partially preserved epithelium. Inset indicates CD3 staining demonstrating minimum infiltration of T cells in the secondary Lewis graft. C, Semiquantification of the number of CD3+ T cells infiltrating in Lewis-derived secondary “iso” graft (Iso) and BN-derived secondary “allo” graft (Allo) demonstrated significant difference (∗, p < 0.05). D, The s.c. BN-derived tracheal graft. “M” indicates mucus produced by the airway epithelium indicated by the arrow. The insets show CD3 staining demonstrating infiltration of T cells in the second intrapulmonary tracheal graft. Lew, Lewis. Moreover, another BN graft implanted in the s.c. tissue at the time of orthotopic lung transplantation showed complete recovery of the epithelium with no evidence of T cell infiltration (Fig. 8⇑D). Thus, the effector function of the intrapulmonary de novo lymphoid tissue has a significant impact on the local immune response against allogenic airways. In the present study, we hypothesized that lymphoid neogenesis plays an important role in chronic rejection after lung transplantation. The human study for the first time demonstrated lymphoid neogenesis in the lung affected by chronic rejection. The animal study demonstrated that intrapulmonary lymphoid tissue has an effector function sufficient to reject allograft airways. These results support our hypothesized role of lymphoid neogenesis in chronic rejection after lung transplantation. In the human study, we observed a number of lymphoid tissues composed of T cells, B cells, and HEVs (Fig. 1⇑) in association with lesions of OB and lymphocytic bronchioles after lung transplantation (Fig. 2⇑), suggesting lymphoid neogenesis in chronic rejection after lung transplantation. Although lymphoid neogenesis has been observed in chronically rejected human kidney, liver (7), and heart (27, 28), lymphoid neogenesis has not been reported in lung transplantation. It is possible that the presumed existence of “constitutive BALT” has made lymphoid neogenesis in the lung less obvious. However, BALT has been demonstrated not to exist in normal human lungs (29). We also observed a significantly larger number of lymphoid tissues containing HEVs in BOS lungs than in normal control lungs (Fig. 3⇑), suggesting the process of lymphoid neogenesis in transplanted lungs. Compared with reported lymphoid neogenesis (3, 4, 5, 6), lymphoid tissue in transplanted lungs is unique in the lack of delineated T cell and B cell zones and follicular dendritic cells (Fig. 1⇑). In the lung, similar, less organized lymphoid tissue that does not meet the conventional criteria of secondary and tertiary lymphoid tissue has been reported (13). However, the functional significance of such anatomical variations among intrapulmonary lymphoid tissue remains unclear. Indeed, the most important factor in lymphoid neogenesis may be the distribution of effector lymphocytes in peripheral organs, particularly at the sites of pathogen entry such as mucosal surfaces of the lung and gut (30). ELT has been proposed to describe a functionally unique subset of lymphoid tissue that collects effector and effector memory T cells regardless of anatomically defined structures (16). Our finding of predominant CD45RO+CCR7− effector memory T cells supports the formation of ELT after lung transplantation (Fig. 1⇑). Furthermore, even in a s.c. tracheal transplant model of OB, the trafficking of effector T cells to the lung has been reported (31). This evidence suggests the important role of the lung as a “reservoir” of effector and effector memory T cells that may contribute to allograft airway rejection after lung transplantation (19). Our human study was, however, limited in the functional assessment of lymphoid neogenesis. To overcome the challenge, we used an animal model of OB in which the allograft airway is exposed to the pulmonary milieu (22). In the model, we observed a larger number of lymphoid tissues in the lung after allograft transplantation compared with that of isografts (Fig. 4⇑), demonstrating that allograft airway rejection is accompanied by significant intrapulmonary lymphoid neogenesis. In contrast, the lymphoid tissue did not result in obliteration of the airways around which lymphoid tissue is formed, even after 120 days (Fig. 4⇑). This is likely explained by the nature of the intrapulmonary tracheal transplantation in which lymphoid tissue is formed in the native (recipient) lung instead of the donor lung as seen in human lung transplantation. Because the epithelium is considered to be the primary target of allograft airway rejection (32), the airway that is not allogenic may not be significantly affected. 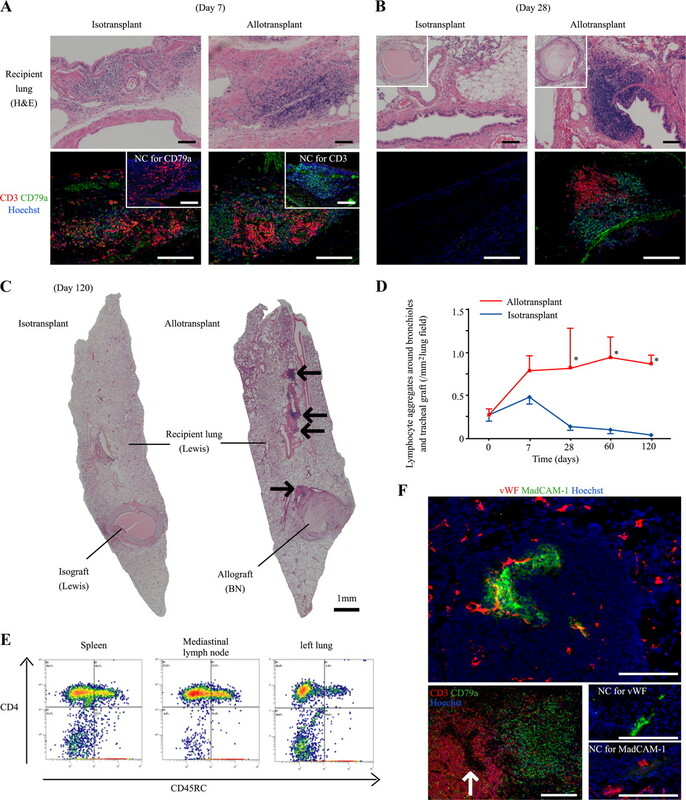 To further assess the role of lymphoid neogenesis in allograft airway rejection, we orthotopically transplanted the lung containing de novo lymphoid tissue into an F1 rat, which dissected the immune response mediated by the de novo lymphoid tissue from that mediated by conventional secondary lymphoid tissue such as regional lymph node tissue (Fig. 5⇑A). Interestingly, using this newly devised animal model of OB, we found that lymphocyte aggregates at day 7 after intrapulmonary allograft transplantation are still reversible (Fig. 5⇑) while the lymphocyte aggregates become more stable after day 28 (Fig. 6⇑ and 7⇑), suggesting that there is a maturation process in lymphoid neogenesis. Recent studies in chronic inflammatory disorders such as rheumatoid arthritis suggest that the critical switch from acute, resolvable inflammation to persistent, poorly resolvable inflammation lies in phenotypical alterations of resident cells, including endothelial cells (33, 34). These cells begin to express adhesion molecules (e.g., PNAd) and ectopic lymphoid chemokines (e.g., CCL21) in response to inflammatory stimuli (35) such as TNF (36), and the altered tissue microenvironment allows for a large influx and survival of Ag-specific lymphocytes in peripheral tissue (35). Interestingly, we found that lymphocytic bronchiolitis, a presumed precursor of OB (37, 38) but still a reversible condition (39), accompanies abundant HEVs and lymphocytes (Fig. 2⇑), indicating that lymphoid neogenesis is initiated before the development of OB. Moreover, considering alloantigen-independent inflammatory stimuli such as ischemia-reperfusion injury at the time of transplantation (40), bacterial colonization in airways (41, 42), and bile/acid aspiration (43, 44) that contribute to OB/BOS, these Ag-independent factors might be enough to activate resident cells such as endothelial cells in airways to initiate lymphoid neogenesis. An interesting question to be answered in the future is how soon such phenotypical changes in the resident cells (e.g., endothelial cells) leading to lymphoid neogenesis start after lung transplantation. The initial set of retransplantation experiments (Figs. 5–7⇑⇑⇑), however, did not clarify the role of the mature intrapulmonary lymphoid tissue in allograft airway rejection, because the first tracheal graft was already rejected and obliterated at day 28 when the orthotopic lung transplantation was conducted. Thus, we further implanted secondary tracheal graft at the time of orthotopic lung transplantation into an F1 rat (Fig. 8⇑A). In this experiment, we observed massive infiltration of T cells into allografts but not isografts (Fig. 8⇑), suggesting an allospecific effector function of the lymphoid tissue in the lung or in ELT in general (16). Moreover, because the s.c. allograft remained intact, the effector function of intrapulmonary lymphoid tissue was more important in local than in systemic immune response as indicated in another report on iBALT (11). Interestingly, we found that the secondary isografts implanted in the lung containing lymphoid tissue also show pathological changes such as epithelial loss and loose fibrosis formation, albeit free of T cell infiltration (Fig. 8⇑). 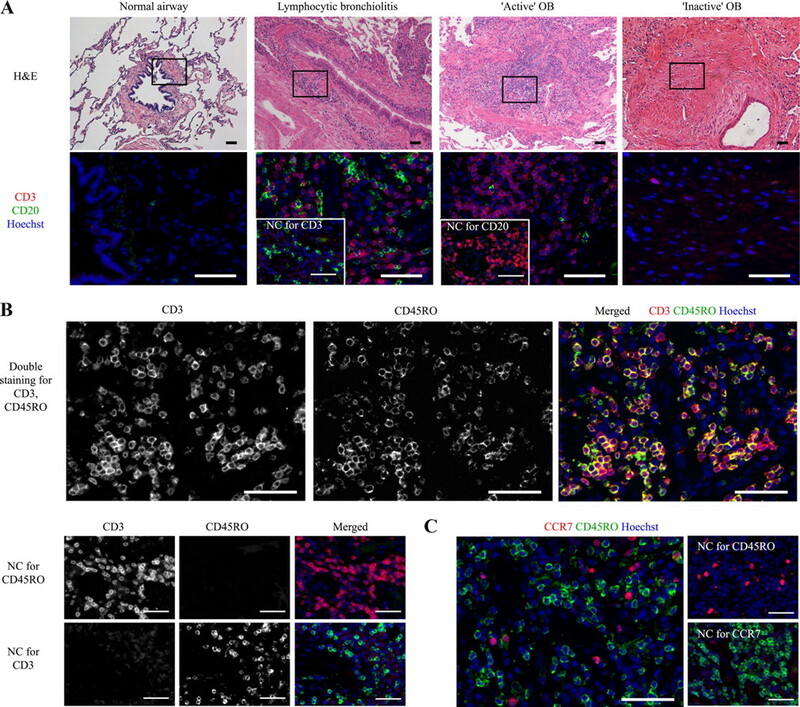 It is possible that the inflammatory microenvironment created by intrapulmonary lymphoid tissue affected the isograft in an alloantigen-independent manner and delayed normal epithelial regeneration. To further clarify the role of memory T cells, Ab-mediated T cell depletion would be the ideal experiment. However, the efficacy of Ab-mediated T cell depletion was limited in rats in our own experience as well as in the literature (45). A mouse intrapulmonary tracheal transplant model that we have recently developed (46) may help to overcome the challenge. We acknowledge that the animal model we used has multiple limitations, including the initial intrapulmonary tracheal transplantation (not transplantation of the entire lung) and the lack of immunosuppression. Differences among species are another important limitation of an animal experiment, particularly in the organization of intrapulmonary lymphoid tissues such as BALT (29, 47). Despite these limitations, we emphasize that the animal experiments in the present study complemented the limitations in the human study in many ways and provided important insights regarding the role of intrapulmonary de novo lymphoid tissue in OB after lung transplantation. In conclusion, we found de novo lymphoid tissue in the lung affected by chronic rejection after human lung transplantation. The de novo lymphoid tissue likely plays a role in chronic local immune responses after lung transplantation. Further studies are obviously necessary to improve our understanding of this novel form of lymphoid tissue and its contribution to the development of OB after lung transplantation. ↵1 This work was supported by the Canadian Cystic Fibrosis Foundation. M.S. is a recipient of Wyeth/Canadian Institutes of Health Research Rx&D Industrial Partner Program Fellowship (2005–2007) and Canadian Cystic Fibrosis Foundation Postdoctoral Fellowship (2007–2009). ↵3 Abbreviations used in this paper: TLO, tertiary lymphoid organ; BALT, bronchus-associated lymphoid tissue; BN, Brown Norway; BOS, bronchiolitis obliterans; ELT, effector lymphoid tissue; HEV, high endothelial venule; iBALT, inducible BALT; MAdCAM, mucosal addressin cell adhesion molecule; OB, obliterative bronchiolitis; PNAd, peripheral node addressin. Aloisi, F., R. Pujol-Borrell. 2006. Lymphoid neogenesis in chronic inflammatory diseases. Nat. Rev. Immunol. 6: 205-217. Motallebzadeh, R., E. M. Bolton, G. J. Pettigrew. 2008. Lymphoid tissue formation in allografts: innocent until proven guilty. Transplantation 85: 309-311. Armengol, M. P., M. Juan, A. Lucas-Martin, M. T. Fernandez-Figueras, D. Jaraquemada, T. Gallart, R. Pujol-Borrell. 2001. Thyroid autoimmune disease: demonstration of thyroid antigen-specific B cells and recombination-activating gene expression in chemokine-containing active intrathyroidal germinal centers. Am. J. Pathol. 159: 861-873. Salomonsson, S., M. V. Jonsson, K. Skarstein, K. A. Brokstad, P. Hjelmstrom, M. Wahren-Herlenius, R. Jonsson. 2003. Cellular basis of ectopic germinal center formation and autoantibody production in the target organ of patients with Sjogren’s syndrome. Arthritis Rheum. 48: 3187-3201. Murakami, J., Y. Shimizu, Y. Kashii, T. Kato, M. Minemura, K. Okada, S. Nambu, T. Takahara, K. Higuchi, Y. Maeda, et al 1999. Functional B-cell response in intrahepatic lymphoid follicles in chronic hepatitis C. Hepatology 30: 143-150. Kobayashi, M., J. Mitoma, N. Nakamura, T. Katsuyama, J. Nakayama, M. Fukuda. 2004. Induction of peripheral lymph node addressin in human gastric mucosa infected by Helicobacter pylori. Proc. Natl. Acad. Sci. USA 101: 17807-17812. Thaunat, O., A. C. Field, J. Dai, L. Louedec, N. Patey, M. F. Bloch, C. Mandet, M. F. Belair, P. Bruneval, O. Meilhac, et al 2005. Lymphoid neogenesis in chronic rejection: evidence for a local humoral alloimmune response. Proc. Natl. Acad. Sci. USA 102: 14723-14728. Baddoura, F. K., I. W. Nasr, B. Wrobel, Q. Li, N. H. Ruddle, F. G. Lakkis. 2005. Lymphoid neogenesis in murine cardiac allografts undergoing chronic rejection. Am. J. Transplant. 5: 510-516. Nasr, I. W., M. Reel, M. H. Oberbarnscheidt, R. H. Mounzer, F. K. Baddoura, N. H. Ruddle, F. G. Lakkis. 2007. Tertiary lymphoid tissues generate effector and memory T cells that lead to allograft rejection. Am. J. Transplant. 7: 1071-1079. Sato, M., S. Keshavjee. 2008. Bronchiolitis obliterans syndrome: alloimmune-dependent and -independent injury with aberrant tissue remodeling. Semin. Thorac. Cardiovasc. Surg. 20: 173-182. Moyron-Quiroz, J. E., J. Rangel-Moreno, K. Kusser, L. Hartson, F. Sprague, S. Goodrich, D. L. Woodland, F. E. Lund, T. D. Randall. 2004. Role of inducible bronchus associated lymphoid tissue (iBALT) in respiratory immunity. Nat. Med. 10: 927-934. Hogg, J. C., F. Chu, S. Utokaparch, R. Woods, W. M. Elliott, L. Buzatu, R. M. Cherniack, R. M. Rogers, F. C. Sciurba, H. O. Coxson, P. D. Pare. 2004. The nature of small-airway obstruction in chronic obstructive pulmonary disease. N. Engl. J. Med. 350: 2645-2653. Rangel-Moreno, J., L. Hartson, C. Navarro, M. Gaxiola, M. Selman, T. D. Randall. 2006. Inducible bronchus-associated lymphoid tissue (iBALT) in patients with pulmonary complications of rheumatoid arthritis. J. Clin. Invest. 116: 3183-3194. Suda, T., K. Chida, H. Hayakawa, S. Imokawa, M. Iwata, H. Nakamura, A. Sato. 1999. Development of bronchus-associated lymphoid tissue in chronic hypersensitivity pneumonitis. Chest 115: 357-363. Hasegawa, T., A. Iacono, S. A. Yousem. 1999. The significance of bronchus-associated lymphoid tissue in human lung transplantation: is there an association with acute and chronic rejection?. Transplantation 67: 381-385.
van Panhuys, N., R. Perret, M. Prout, F. Ronchese, G. Le Gros. 2005. Effector lymphoid tissue and its crucial role in protective immunity. Trends Immunol. 26: 242-247. Masopust, D., V. Vezys, A. L. Marzo, L. Lefrancois. 2001. Preferential localization of effector memory cells in nonlymphoid tissue. Science 291: 2413-2417. Reinhardt, R. L., A. Khoruts, R. Merica, T. Zell, M. K. Jenkins. 2001. Visualizing the generation of memory CD4 T cells in the whole body. Nature 410: 101-105. McDyer, J. F.. 2007. Human and murine obliterative bronchiolitis in transplant. Proc. Am. Thorac. Soc. 4: 37-43. Dutly, A. E., C. F. Andrade, R. Verkaik, L. Kugathasan, J. Trogadis, M. Liu, T. K. Waddell, D. J. Stewart, S. Keshavjee. 2005. A novel model for post-transplant obliterative airway disease reveals angiogenesis from the pulmonary circulation. Am. J. Transplant. 5: 248-254. Hirayama, S., T. Shiraishi, T. Shirakusa, T. Higuchi, E. J. Miller. 2006. 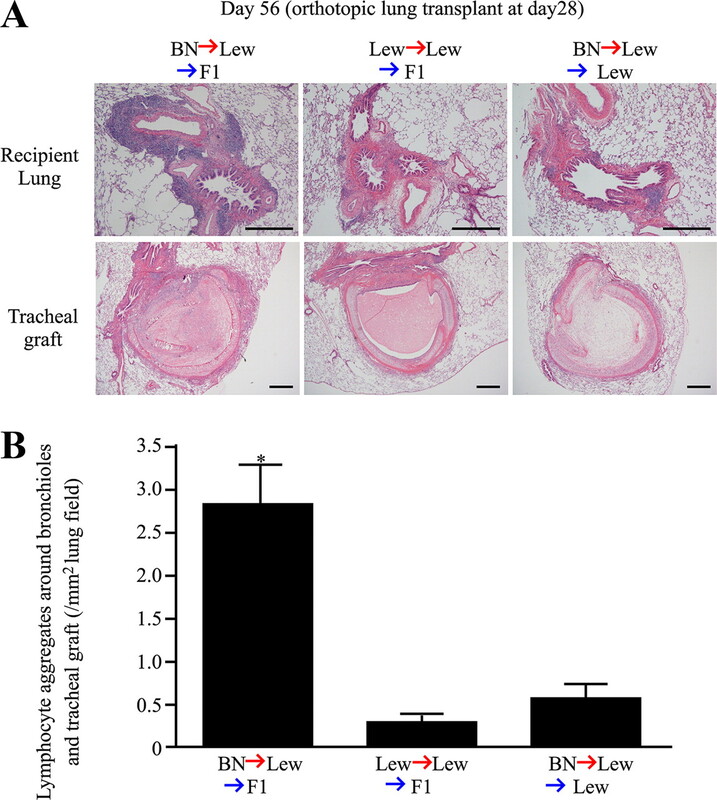 Prevention of neutrophil migration ameliorates rat lung allograft rejection. Mol. Med. 12: 208-213. Sato, M., M. Liu, M. Anraku, T. Ogura, G. D'Cruz, B. A. Alman, T. K. Waddell, E. Kim, L. Zhang, S. Keshavjee. 2008. Allograft airway fibrosis in the pulmonary milieu: a disorder of tissue remodeling. Am. J. Transplant. 8: 517-528. Tough, D., J. Sprent. 2003. Immunological memory. M. Paul, ed. Fundamental Immunology 5th Ed.865-899. Lippincott Williams & Wilkins, Philadelphia. Girard, J. P., T. A. Springer. 1995. High endothelial venules (HEVs): specialized endothelium for lymphocyte migration. Immunol. Today 16: 449-457. Marquez, M. G., G. A. Sosa, M. E.-. Roux. 2000. Developmental study of immunocompetent cells in the bronchus-associated lymphoid tissue (BALT) from Wistar rats. Dev. Comp Immunol 24: 683-689. Epler, G. R.. 1988. Bronchiolitis obliterans and airways obstruction associated with graft-versus-host disease. Clin. Chest Med. 9: 551-556. Di Carlo, E., T. D'Antuono, S. Contento, M. Di Nicola, E. Ballone, C. Sorrentino. 2007. Quilty effect has the features of lymphoid neogenesis and shares CXCL13-CXCR5 pathway with recurrent acute cardiac rejections. Am. J. Transplant 7: 201-210. Sattar, H. A., A. N. Husain, A. Y. Kim, T. Krausz. 2006. The presence of a CD21+ follicular dendritic cell network distinguishes invasive Quilty lesions from cardiac acute cellular rejection. Am. J. Surg. Pathol. 30: 1008-1013. Tschernig, T., R. Pabst. 2000. Bronchus-associated lymphoid tissue (BALT) is not present in the normal adult lung but in different diseases. Pathobiology 68: 1-8. Cheroutre, H., L. Madakamutil. 2004. Acquired and natural memory T cells join forces at the mucosal front line. Nat. Rev. Immunol. 4: 290-300. West, E. E., T. L. Lavoie, J. B. Orens, E. S. Chen, S. Q. Ye, F. D. Finkelman, J. G. Garcia, J. F. McDyer. 2006. Pluripotent allospecific CD8+ effector T cells traffic to lung in murine obliterative airway disease. Am. J. Respir Cell Mol. Biol. 34: 108-118. Fernandez, F. G., A. Jaramillo, C. Chen, D. Z. Liu, T. Tung, G. A. Patterson, T. Mohanakumar. 2004. Airway epithelium is the primary target of allograft rejection in murine obliterative airway disease. Am. J. Transplant. 4: 319-325. Filer, A., C. Pitzalis, C. D. Buckley. 2006. Targeting the stromal microenvironment in chronic inflammation. Curr. Opin. Pharmacol. 6: 393-400. Parsonage, G., A. D. Filer, O. Haworth, G. B. Nash, G. E. Rainger, M. Salmon, C. D. Buckley. 2005. A stromal address code defined by fibroblasts. Trends Immunol. 26: 150-156. Douglas, M. R., K. E. Morrison, M. Salmon, C. D. Buckley. 2002. Why does inflammation persist: a dominant role for the stromal microenvironment?. Expert Rev. Mol. Med. 4: 1-18. Sikorski, E. E., R. Hallmann, E. L. Berg, E. C. Butcher. 1993. The Peyer’s patch high endothelial receptor for lymphocytes, the mucosal vascular addressin, is induced on a murine endothelial cell line by tumor necrosis factor-α and IL-1. J. Immunol. 151: 5239-5250. Boehler, A., D. Chamberlain, S. Kesten, A. S. Slutsky, M. Liu, S. Keshavjee. 1997. Lymphocytic airway infiltration as a precursor to fibrous obliteration in a rat model of bronchiolitis obliterans. Transplantation 64: 311-317. Glanville, A. R., C. L. Aboyoun, A. Havryk, M. Plit, S. Rainer, M. A. Malouf. 2008. Severity of lymphocytic bronchiolitis predicts long-term outcome after lung transplantation. Am. J. Respir. Crit. Care Med. 177: 1033-1040. Yousem, S. A.. 1993. Lymphocytic bronchitis/bronchiolitis in lung allograft recipients. Am. J. Surg. Pathol. 17: 491-496. Daud, S. A., R. D. Yusen, B. F. Meyers, M. M. Chakinala, M. J. Walter, A. A. Aloush, G. A. Patterson, E. P. Trulock, R. R. Hachem. 2007. Impact of immediate primary lung allograft dysfunction on bronchiolitis obliterans syndrome. Am. J. Respir. Crit. Care Med. 175: 507-513. Vos, R., B. M. Vanaudenaerde, L. J. Dupont, D. E. Van Raemdonck, G. M. Verleden. 2007. Transient airway colonization is associated with airway inflammation after lung transplantation. Am. J. Transplant. 7: 1278-1287. Botha, P., L. Archer, R. L. Anderson, J. Lordan, J. H. Dark, P. A. Corris, K. Gould, A. J. Fisher. 2008. Pseudomonas aeruginosa colonization of the allograft after lung transplantation and the risk of bronchiolitis obliterans syndrome. Transplantation 85: 771-774. D'Ovidio, F., M. Mura, M. Tsang, T. K. Waddell, M. A. Hutcheon, L. G. Singer, D. Hadjiliadis, C. Chaparro, C. Gutierrez, A. Pierre, et al 2005. Bile acid aspiration and the development of bronchiolitis obliterans after lung transplantation. J. Thorac. Cardiovasc. Surg. 129: 1144-1152. Hadjiliadis, D., R. Duane Davis, M. P. Steele, R. H. Messier, C. L. Lau, S. S. Eubanks, S. M. Palmer. 2003. Gastroesophageal reflux disease in lung transplant recipients. Clin. Transplant. 17: 363-368. Plain, K. M., L. Fava, A. Spinelli, X. Y. He, J. Chen, R. Boyd, C. L. Davidson, B. M. Hall. 1997. Induction of tolerance with nondepleting anti-CD4 monoclonal antibodies is associated with down-regulation of TH2 cytokines. Transplantation 64: 1559-1567. Pabst, R., I. Gehrke. 1990. Is the bronchus-associated lymphoid tissue (BALT) an integral structure of the lung in normal mammals, including humans?. Am. J. Respir. Cell Mol. Biol. 3: 131-135.